PAIR OF CHRYSLER DODGE MITSUBISHI. Acclaim Caravan Daytona Dynasty Lebaron New Yorker Shadow Spirit Sundance Voyager Stealth D50 Ram 50 Raider. 3.0 SOHC CYLINDER HEAD ROLLER CAM. This head fit 1990 - 2001 cars and vans with the 3.0 engine. THIS SALE IS FOR A PAIR OF CYLINDER HEADS, RIGHT AND LEFT SIDE. 1990 - 1995 LE BARON. 1990 - 1993 NEW YORKER. 1990 - 1991 RAM 50. 1997 - 1998 MONTERO SPORT. If you need to leave us information about the cylinder head features you need. Example- The cast number is or I need the driver side head do the following. 1 CHOOSE A QUANTITY (LOCATED DIRECTLY ABOVE THE PRICE). FIND THE ORDER DETAIL BOX. IN SMALL PRINT YOU WILL SEE MESSAGE FOR ODESSACYLINDERHEAD ADD MESSAGE. TYPE YOUR CYLINDER HEAD INFORMATION. PLEASE INCLUDE YOUR AREA CODE AND TELEPHONE NUMBER. ODESSACYLINDERHEAD thoroughly cleans, inspects, and pressure tests all our cylinder heads. All seat and guide work is performed as needed on the lastest state of the art Serdi or Sunnen seat and guide machine. We then install a quality valve seal and pull a vacuum on each valve to insure their is a perfect seal between the valve and the seat. All machine is work performed on the latest state of the art equipment. The head is complete and ready for installation. WE ARE A HUGE CYLINDER HEAD SHOP WITH THOUSANDS OF HEADS IN STOCK. WE DEAL WITH ALL MAKE AND MODEL CYLINDER HEADS. HAVE A RARE OR HARD TO FIND CYLINDER HEAD? LET US REBUILD YOUR CYLINDER HEAD FOR YOU. We will accept your old cylinder head no matter what is wrong with it as long as it includes all the parts that our head came with. You will never be charged extra because your old head is damaged. (as long as you put all of the parts in the box). We have no up-front core charge. TOOL FEATURE IS CLOSE BUT NOT PERFECT. We invite you to read this entire document carefully prior to installing your cylinder head. Heat tab must be in place on head, not altered or melted. A copy of invoice must accompany head. A Return Authorization number must be obtained. No incidental, consequential, punitive or over the road damages. L A B O R. Damage caused by improper installation, accidental over heating, abuse or neglect. Fluids, tow charges, rentals or diagnosis. Repairs made without prior authorization will void all warranties. If you bought a cylinder head that requires a core return you will find the free UPS return label. Located with the invoice under plastic on the outside of the box. The item "2 CHRYSLER DODGE Plymouth MITSU 3.0 SOHC CYLINDER HEADS ROLLER CAM 90-01 REBUILT" is in sale since Tuesday, February 16, 2016. This item is in the category "eBay Motors\Parts & Accessories\Car & Truck Parts\Engines & Components\Cylinder Heads & Parts". 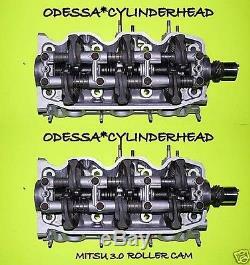 The seller is "odessa*cylinderhead" and is located in Clearwater, Florida. This item can be shipped to United States. Core Charge: Core must be returned. Use our free UPS label.